Children’s book illustrators and aspiring illustrators were among those who tuned in from the U.S. to Portugal, and Australia to South Africa Saturday morning (Texas time) for an online class on the InteractBuilder software. They were learning about a new venue for their narrative art: A new kind of book for iPads, iPhones and other touch screen gadgets. Such books combine elements of an illustrated storybook, e-book, game app and toy for a new kind of reading and learning that engages with your fingertips. Videos shown on this post today are not InteractBook brand books and were not made with InteractBuilder. They were made by other book app publishers. But they give an idea of the interactive book experience. We’ll see some InteractBook examples in the next post, including winning entries of the InteractBuilder Contest that concluded in October. Saturday’s class was the first in a series of eight Saturday sesions. The classes, which are free, amount to a complete training on InteractBuilder. This software is presently offered at no charge to individual “book builders”, developer and company founder Ezra Weinstein said Saturday. You’ll learn enough in the class series to be able to build your own digital book on your PC or Mac — and in plenty of time to enter your creation in the 2nd InteractBook Contest, he said. He announced the new contest in Saturday’s class. Deadline: April 1, 2012. The company is working on a simulator for the PC, however. Also it expects to have the InteractBuilder software ready to work for Android tablets (such as the Kindle Fire) sometime next year, Weinstein said. “I knew I was behind in tech knowledge. I just never dreamed how very far behind,” said a student after the two hour introductory class Saturday. The series of trainings aims to bridge the knowledge gap and inspire illustrators and writers to think about a new kind of content — unfamiliar and perhaps even a bit unfathomable to those of us who grew up with paper books, but not mysterious or strange to a new generation of young readers. On Saturday Ezra showed how to assemble a page with text and images (created in tools like Photoshop and Gimp) and bring it to captivating interactive life using the InteractiveBuilder dashboard. He introduced the building blocks for structuring the reading experience of an InteractBook: Elements, Intersections, Interactions and Behaviors. He also explained how the publishing business model would work for creators. For example, if your book sells for U.S. $1 on Apple iTunes in the InteractBooks store, Apple will get its cut — 30 percent. InteractBooks, as publisher would take 21 percent. 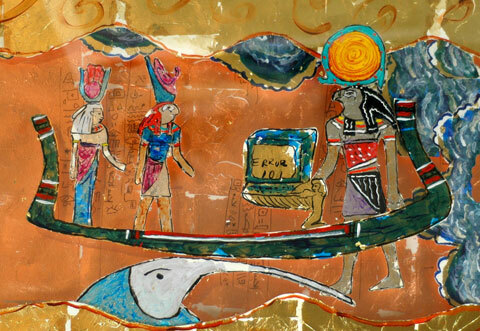 The author-illustrator would receive what’s left — 49 percent. 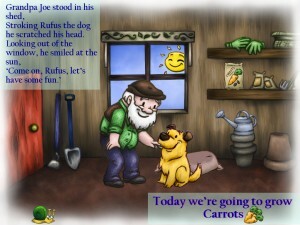 Grandpa and Rufus from "It's Time for Carrots"
Illustrators could generate additional revenues from the sale of bookshelf designs and shelf “decorations.” Think: Stickers. Virtual bracelet charms. Pokemon. Hello Kitty. A book would not have to begin and end its life as strictly InteractBook virtual property, either. And he offered an editorial tip to book builders: “Try not to distance the reader from the story” with all the distracting interactive features one of these books can offer, he said. This Saturday, April 17, Weinstein will teach the second of the eight free classes on how to produce an interactive illustrated children’s book for the iPad, iPhone and other touch screen devices using InteractBuilder software. See more details, a class schedule and a replay of this past Saturday’s class here. Discover how author-illustrator David Tribble produced his technology themed-picture book Lord of the Scribes for the iPad, using Apple’s Fixed Layout ePub. 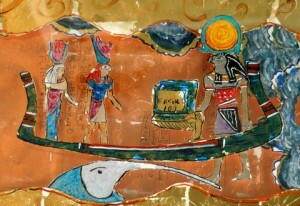 He shares his process in the replay of an online presentation that he gave to “Marks and Splashes” students on Monday. See more. 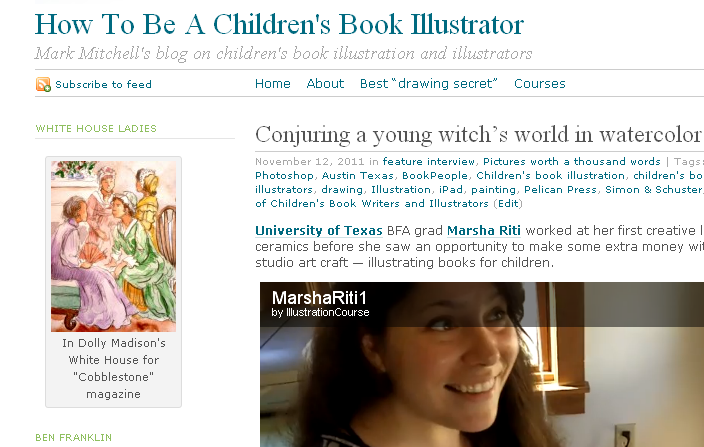 Watch the interview with illustrator Marsha Riti about her first published book on the How to Be A Children’s Book Illustrator blog. 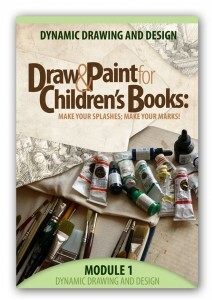 Learn a most useful secret for good drawing and discover the Make Your Marks-Make Your Splashes! 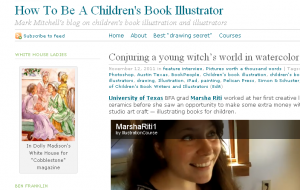 online course on how to illustrate children’s books effectively and beautifully.